Gorgeous soft Ivory patterned tunic for sale (has slight bobbling which doesn't show when on & refflected in price). Patterned with black and brown splashes. Looks lovely with black leggings. Label states 12, but will also fit a size 14. Roman Originals Summet Dress Size 18 In Black/white/red. Condition is Used. Dispatched with Royal Mail 2nd Class. 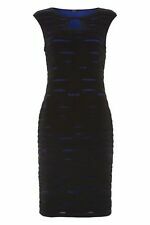 Ladies roman originals dress size 14. Beautiful on. Super flattering. Lots of compliments when I wore it. Excellent condition. Worn twice. One wedding and one christening. Dispatched with Royal Mail 2nd Class. Lady’s ROMAN ORIGINALS lined black/silver dress, Size 16, 39” length. Lady’s ROMAN ORIGINALS lined black/silver dress, Size 16, 39” length. Worn once. From smoke free home. Very good condition. Used. Dispatched with Royal Mail 2nd Class. Ladies Roman Dress size 18 length from shoulder 42" sleeveless, waist approx 38"-39", creased look fabric, floral swirl patterned top high, mid bow and plain lower high, single back split, side zip fastening, in very good condition. COMING IN A PRETTY IVORY AND BLACK BOLD FLORAL DESIGN THIS ELEGANT DRESS HAS A SCOOPED NECKLINE AND CAPPED SLEEVES. CHEST 42" LENGTH FROM NAPE OF NECK TO HEM 39" APPROX. STYLE - Fabulous deep coral broderie anglais pencil dress with an embellished neckline sleeveless and pencil style fully lined keyhole and back zip fastening. LENGTH 38". SIZE UK16. Lovely tunic dress great with leggings. Dispatched with Royal Mail 2nd Class. Stunning purple and red floral print chiffon/sheer lined dress with matching shrug/bolero from Roman Originals. Length: 23". Underarm to Underarm: 21". Underarm to underarm: 21". LINED CHIFFON DRESS & SCARF BY ROMAN ORIGINALS IN VG CON SIZE UK 16 BUST 42"
Special occasion coming up?. Then this dress could be perfect for you. The dress is ivory with black lace accents. The dress has stitched horizontal seams with horizontal panels of various sized lace in between the seams. Ladies roman originals dress size 16. Condition is Used. Dispatched with eBay delivery – Shutl 2-3 days. 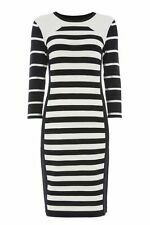 Roman originals bodycon style dress. Mainly white with a black floral pattern. Small back slit. Roman originals Black & white polka dot dress size 20. The dress is fully lined and fastens with a zip at the back the front and back are 43in from top of shoulder to bottom of hem the dress has 2 faux zips at the front it is a beautiful floaty dress and perfect for a wedding or othe special occassion. The sides are 52in from top of shoulder to bottom of hem And 22in from underarm to underarm. I bought the dress for a wedding but did not wear this one The dress was £50 when i bought it but selling for £21.50 buy it now or why not bid you may get it for £15 why not grab a bargain selling due to loosing weight. Any questions please ask thanks for looking. .
Roman navy lace dress size 18 sleeveless lined round neck. I have worn dress a few times and it is very good condition .The dress hassilver flower petals on the lace. roman originals dress 18. Dispatched with Royal Mail 1st Class. Gorgeous Roman Original size 18 dress. Bought for a work party but changed mind. Never been worn apart from trying on at home. Gorgeous colour detail with flowers, bodycon style. Very comfortable. Zip fastening on the back. Suitable for any occasion. Give yourself a reality check and invest in the 90s trend. Team with boots and coat for a cosy look. Mock Pocket Detail. Machine Washable. 3/4 Length Sleeves. Knee Length. Side splits, a stunning dress. Lady’s ROMAN ORIGINALS black/red dress, Size 16, 38 “length. Lady’s ROMAN ORIGINALS black/red dress, Size 16, 38” length. Lace shoulders with V neck back and lace overlay on red centre panel. Worn once. Photo 3 displays true colour of red insert. From smoke free home. Very good condition. Used. Dispatched with Royal Mail 2nd Class. Roman Original Black & White Diamond Pattern Size 14. Condition is New with tags. Dispatched with Royal Mail 2nd Class. Ladies Roman Black fitted Dress with Chiffon Overlay Detail. Size 20. Condition is New with tags. Chiffon overlay to Right side of shell dress. Very flattering. Length from back of neck to bottom of dress 100cm/39.5 in. Length from back of neck to longest chiffon drape 116cm/45.5in. Hidden back zip with Hook & Eye at top. Dispatched with Royal Mail 2nd Class. Ladies maxi dress - Roman Originals. Complete with black belt. Too small, hence very reluctant sale. Chest 36" length 39" approx. Lined, zip fastening to rear. Black cream & orange bold floral fit & flare dress. Roman Originals. high shoulder arm holes. Roman originals dress maxi 22. 2 straps on each shoulder fully lined cut on the bias . Condition is Used. Dispatched with Royal Mail 2nd Class. Beautiful Roman Originals size 12 Black layered, 1920/1930s style flapper sleeveless party/prom/evening dress. Diamanté/beading around neckline. The fabric is chiffon-like and layered. 100% polyester. Roman Dress | Size 12 | White Black | Ruffled Bodycon Stretch | Summer Tropical. Condition is Used. Dispatched with Royal Mail 2nd Class. A Beautiful blue mint and red floral layered boho dress with round neckline. Bias cut. Bust 20 ins from pit to pit length 53 ins. 100% viscose. The layers are cut diagonally and give a very flattering shape.